Rose gold is one of my favourite things, just being a cliche blogger here but there is something about rose gold that draws me to it and if something is rose gold i'm definitely more inclined to buy it! 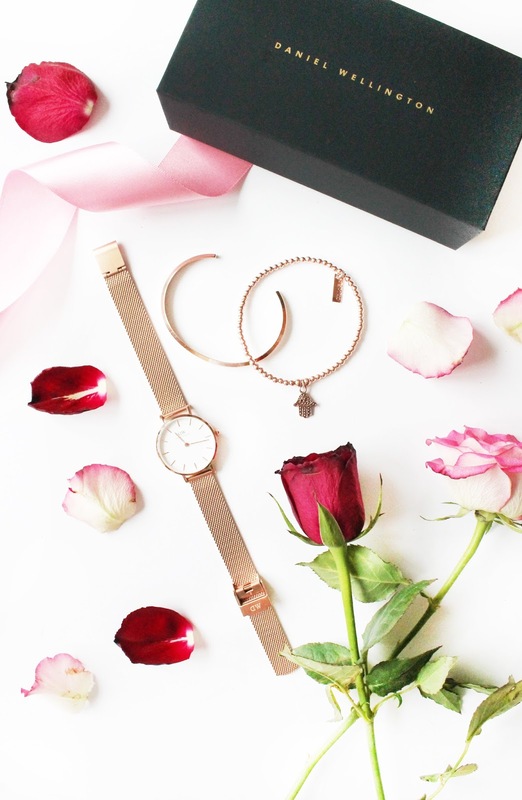 I thought in the spirit of loving all things rose gold that i'd show you three rose gold accessories that I just cannot get enough of at the moment! See which rose gold pieces i've been loving lately.. If you've followed my blog for a while, then you'll know how much I love my Daniel Wellington watches and i've recently added a few others to my collection including the Classic Petite Melrose 28* (£109) which is an absolutely stunning rose gold mesh strap watch, and i've been wanting one of these for so long! I absolutely love the sophistication of this watch and the fact that everything is rose gold, from the strap, to the face and also the clock hands, it's absolutely stunning! Also with the holiday season upon us and in true spirit of Black Friday, Daniel Wellington are currently stocking some absolutely stunning gift sets with a variety to choose from, where you either get a watch and a cuff to match, or a swatch and a changeable strap which I think is such a lovely gift idea and would be perfect for a loved one this season! So to go with my watch, I've been wearing a matching rose gold cuff from the Classic Petite Melrose + Cuff Bundle* (£129) and i've been absolutely loving how these two look together! Finally an accessory that I wear all the time is my ChloBo Charm Decorated Hamsa Bracelet* (£99) which I absolutely love and it goes so well with both the watch and the cuff! So much so that i've been wearing these three accessories together on a daily basis and have gotten some lovely compliments. In celebration of Black Friday Daniel Wellington has some absolutely amazing deals on, so make sure to check out their website and for an additional 15% off, make sure to use my discount code 'STYLEANDSPLURGING'. What is your favourite rose gold accessory?